Convert-It is a nice & simple Windows 8 unit converter app. All it does is to convert entities from one unit to other. This free unit converter Windows 8 app offers support for converting length, volume, mass, area, temperature, energy, power, pressure, time, velocity, and digital storage. Instead of using Convert-It Unit converter app, you can opt for a hard way of calculating things manually. That will train your brain, but might prove a compromise with accuracy. On launching Convert-It Windows App, you will be presented following interface. How To Use Convert-It Windows 8 Unit Converter App? On the top exists the selection box in front of heading ‘Type’ for selecting the type of unit conversion to be performed. Now, depending upon your selection the list of options in the ‘Unit’ dropdowns will change. Use the dropdown at top to select the unit and then select the unit in which to convert from the second dropdown. Next you need to type the value in the textbox at top. Soon after which, the converted amount will be shown to you in the textbox at bottom. You can also copy-paste it as per requirement. * It must be noted that the calculations will be performed on text-change in the textbox at top. You require settings units beforehand. You can also refer to our posts on Unit Converter Apps, and Windows 8 Apps to ask questions. Convert-It windows 8 app can be easily located under ‘Tools’ section of Windows Store. It’s a 100% free standalone app and does not requires any extra permissions. For installing Convert-It unit conversion app you will need to open this link in supported web browser such as IE 10 or advance. Then click on ‘View in Windows Store’ button followed by a click on ‘Install’ button in Store. 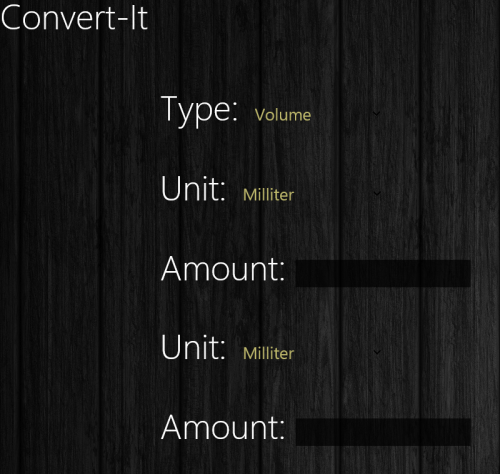 Convert-It is definitely a nice option as a Unit Converter Windows 8 App. Its lightweight, hassle free, and very simple. I have no issues in recommending Convert-It. Students and teachers are likely to be benefited from it.